Maglite’s flagship rechargeable MagCharger flashlight has finally been released with a factory LED module, and this latest entry in the Maglite lineup has 680 lumens of output and an intense 43,667 candela spot beam. The MagCharger LED uses a D-sized NiMH battery pack and is a full-size flashlight with 4.5 hours of regulated runtime on high and 16 hours on low. 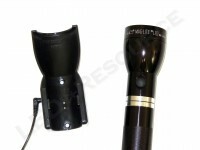 Five modes, including full power, power save, strobe, SOS, and momentary are organized into user-programmable function sets. Weight with Batteries: 28 oz. MSRP for the MagCharger LED is $149.99, and the light is only available in black. Several configurations are available depending on AC plug type, and pricing is around $125 for the most common RL1019 package. 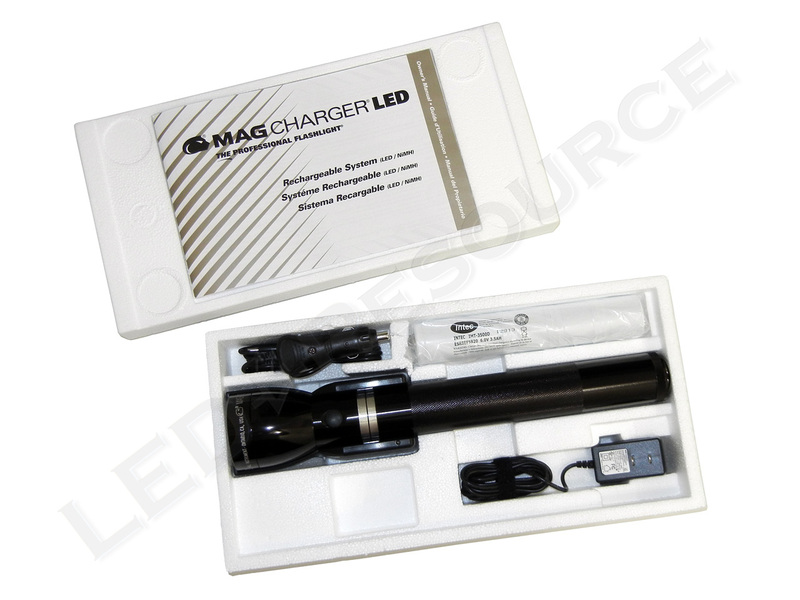 Included in the box are: Maglite MagCharger LED, NiMH rechargeable battery, charging cradle, AC adapter (100-240V), DC car adapter, and user manual. 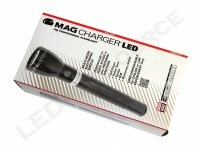 The MagCharger LED uses the same rechargeable battery pack as the updated incandescent MagCharger, which has a 3,500mAh NiMH battery pack and rated for 1,000 cycles. Based on data from the OEM datasheet, this is not low a self-discharge NiMH battery pack and should be charged every couple of months to retain adequate charge. 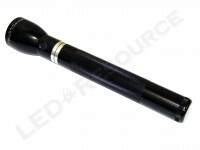 To charge the light, insert the head of the light into the charging cradle, and push down until the barrel locks in place. 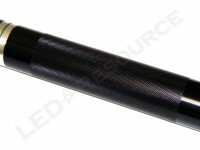 Charging is constant current and continuous, which can take up to 20 hours. The light can be left in the cradle indefinitely, but to prolong battery life, this is not recommended for long periods of inactivity. 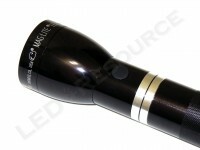 On the exterior, the MagCharger LED is approximately the size of a Maglite 3-cell D and nearly indistinguishable from the incandescent version. This full-sized light has a type-III anodized finish to protect against scratches and corrosion. 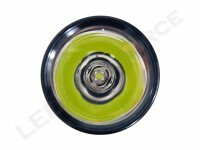 The head features a polycarbonate window and a smooth reflector. Focusing takes less than a quarter turn from end to end, going from flood to spot to flood. 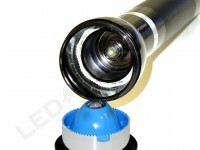 The head mounted switch is an electronic switch similar to that of the XL- and ML-series lights. The MagCharger’s distinctive charging bands are O-ring sealed and diode-protected to prevent accidental short circuiting, and smooth diamond knurling covers most of the body. 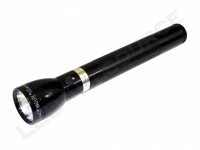 SOS is the International Morse Code Distress Signal: three short flashes, three long flashes, and three short flashes. If momentary is enabled, the light turns off when the switch is released, and it must be pressed twice in quick succession to activate constant-on. Using the latest Cree XM-L2 LED, the MagCharger LED is rated for 680 lumens. 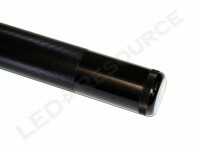 The redesigned focusing assembly eliminates “donut holes” in the beam pattern and makes focusing quicker. 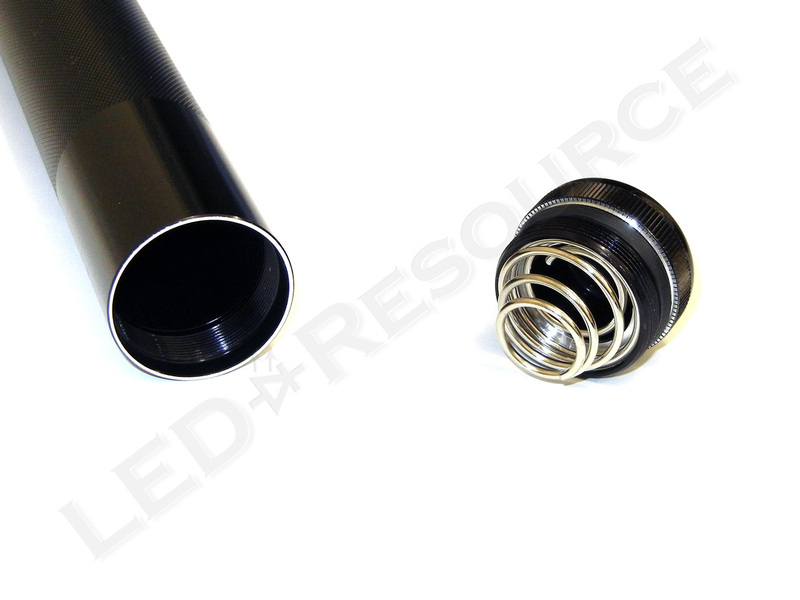 There is a standby current drain of 673 µA (0.673 mA), which combined with NiMH self-discharge, will require the light to be charged every 3-4 months if unused. 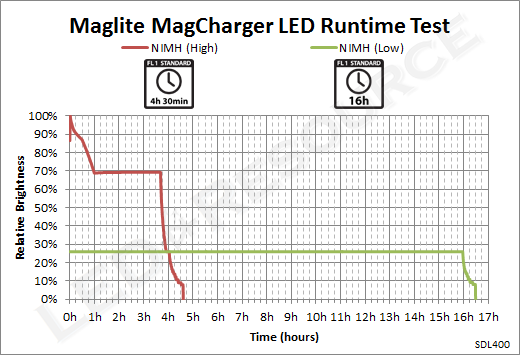 The MagCharger LED steps down to 70% after the first hour and maintains a steady output for almost three more hours. ANSI runtime of the MagCharger LED is 4h 30mins, which is longer than most ultra-high output lights that typically have around two hours of runtime. 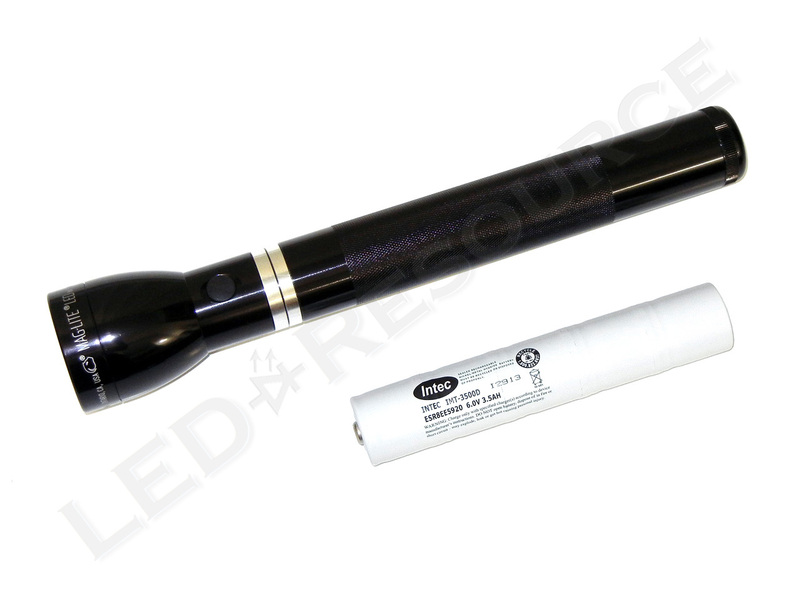 Full-sized lights are less of a common sight nowadays, but with its large NiMH rechargeable battery, the MagCharger LED has roughly twice the runtime of a similar mid-sized light. 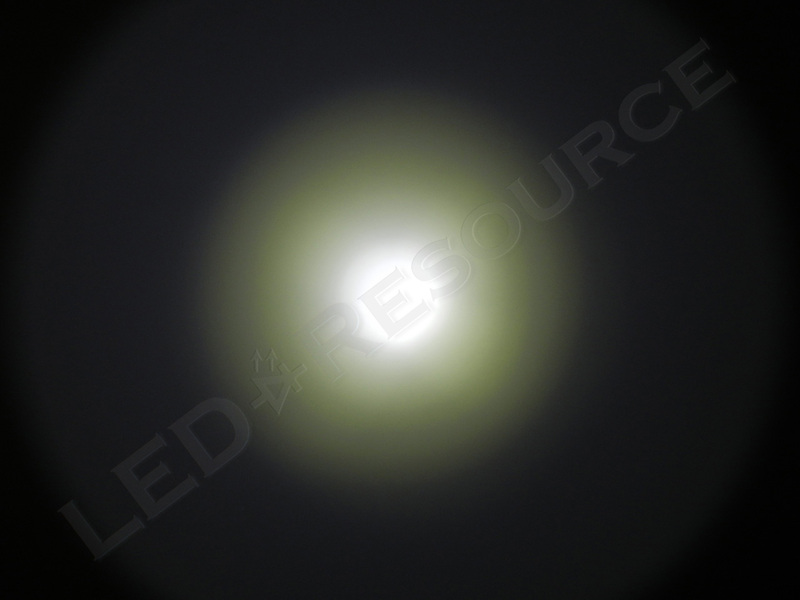 Increased runtime is beneficial for many professional usage scenarios where it may not be possible or desirable to charge batteries, and 4h 30min on maximum output is plenty for most flashlight users. 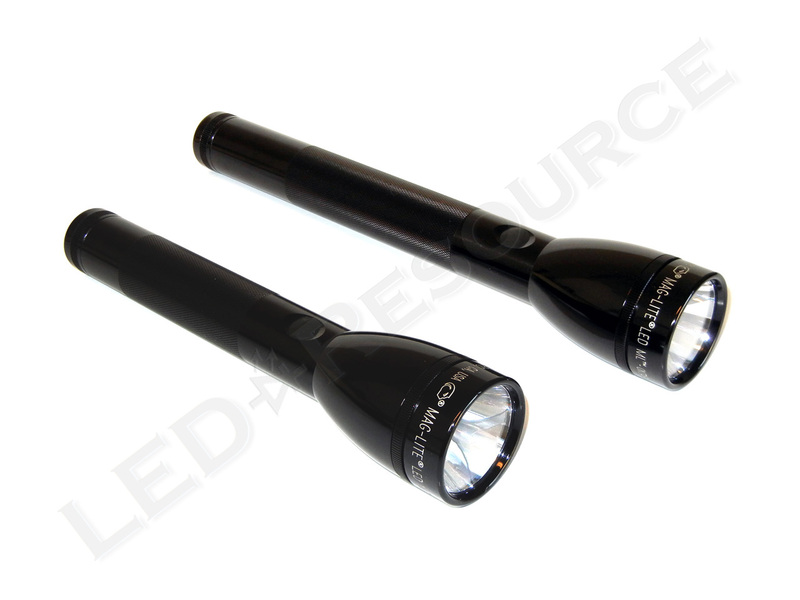 This is also a light that is easily customizable with an option for momentary operation, as well as flashing strobe or SOS modes. 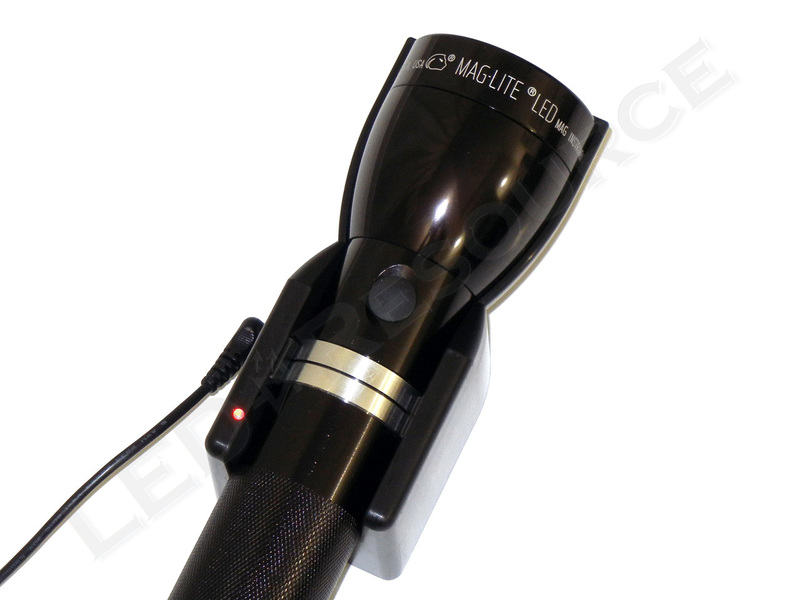 For users coming from alkaline D-cell lights or the incandescent MagCharger, the new Maglite MagCharger LED will easily outperform many lights both small and large. 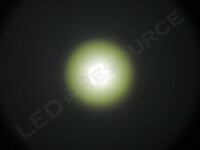 I’ve read in the manual that you are supposed to leave the light in the cradle indefinitely and it will switch between idle and top off mode keeping the flashlight fully charged. You have said above not to leave it in the charger for weeks or months b/c of the risk of overcharging so I am a little confused. Thanks! 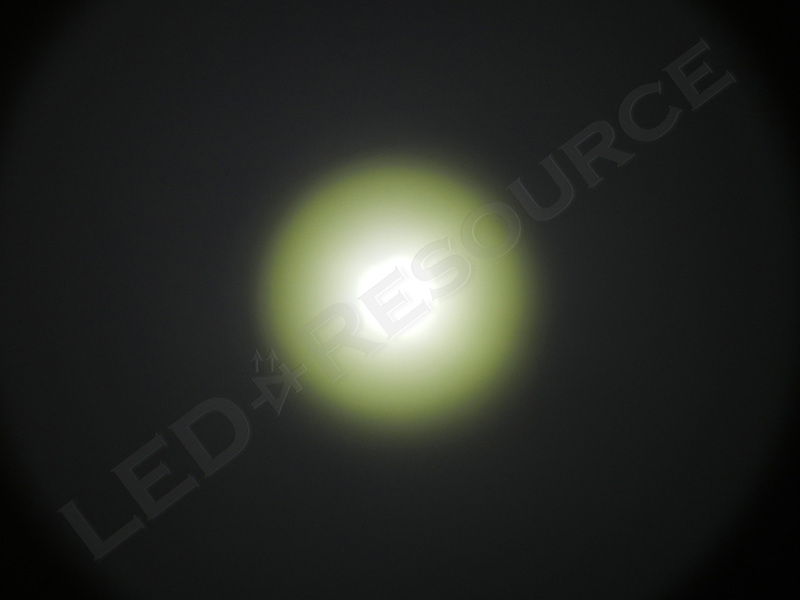 One of the great benefits of full-sized lights like this – or an upgraded incandescent, on the job is imo that they will not end up that easily in someones admiring pocket .. definitely important. Bonjour. 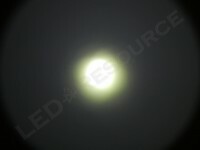 Il ya 2 modèle de magcharger led 643 lumens et 680 lumens ?